This weekend I sat aghast as Turkey voted to take a step back from democracy and grant President Recep Tayyip Erdoğan sweeping new powers that give him wide control over the judiciary, broad powers to make law by decree, abolish the office of the Prime Minister and, effectively, make him a dictator. Today, as Theresa May announces a typically opportunist snap election which will move Britain to the right, impose a hard Brexit on the country and force more cuts I’m struggling to see the difference at home. 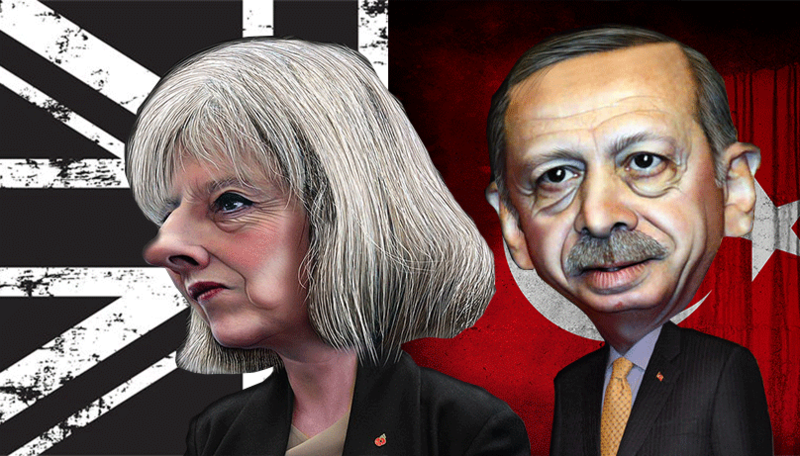 It may seem a little “out there” to compare Britain’s PM with a man who has political ideals rooted in historic and conservative Islam, but May has her fair share of previous when it comes to imposing draconian laws. As Gina Miller noted in the New Statesman this month the Conservative MP has already exploited Henry VIII clauses to take decisions away from MPs, laws that haven’t been used since the early 16th century. It seems “divorce” was to Henry VIII what “Brexit” is to Theresa May, and the PM “is channelling a monarch who was willing to do anything to get himself out of the tight spot he had put himself into”. The Statute of Proclamations allowed the King to change legislation by order, rather than through parliament, which is a method of lawmaking convenient for those in power but wholly at odds with democracy, accountability and the general view of the nation. May’s Great Repeal Bill has obvious parallels and has already been described as the biggest political power grab of modern times, and if history hadn’t intervened it may well have been. It will grant her ministers the ability to rewrite reams of British law without full scrutiny, which could lead to chaos. Who decides which bits we want to amend and which we want to keep? Surely a single administration can’t wield such power over the future of Britain? Well, as this morning’s announcement would suggest, this is precisely what is going to happen. May wants control, she wants power, and she wants to allow herself enough time in which to impose changes which will impact the political landscape in Britain for the foreseeable future. Make no mistake, the snap election due to be held in June is nothing other than a power grab on behalf of the Conservative government, in the same way that a referendum on our European Union membership was a political ploy to ensure they won a parliamentary majority in the first place. Erdogan eat your heart out. I agree with you on the issue of the snap general election; this seems to be clearly inspired be Erdogan’s referendum on new and sweeping powers. Obviously May could never run a carbon copy referendum, however, being returned to power with an increased majority will, she’ll no doubt claim, give her a mandate to carry out whatever policies she deems to be correct; afterall the people have spoken. On the subject of Corbyn, I’ve no doubt he is a very good MP but that alone will never qualify him to be a good PM. I never read the tabloid press haven’t done for many years; I am all too aware of their right wing bias so my opinion of Corbyn is based entirely on his performance; to date he comes across as weak and in an effort to cover that he assumes a strange air of arrogance. I really don’t see him on the world stage against the likes of Putin or Trump etc. The no seats stunt on the train seriously backfired on him indicating to me that he didn’t think to the next level, poor attribute for a prospective leader. Finally, his total U turn on Brexit this leaves me, quite frankly, speechless but shows in stark detail everything I’ve written so far. Blair and Brown turned me off Labour Corbyn has done nothing to inspire me to vote Labour again. I am not sure what qualifications you need to be a “good PM”. The qualities required are often categorised as including leadership, determination, charisma, presence, voter appeal and a host of other indeterminate and hard to define attributes. I would never describe a man who stands by his core beliefs, gives a straight answer to a straight question and regards honesty and integrity in public office as pre requisites as “weak”. Further more surely any one who can inspire so many to join a party and build it into the largest political party group in Europe, who is able to withstand the complete personal denigration he experiences on a daily basis from the UK right wing press, which is in essence 80% of the written media, and the general misinformation spread by the media generally not to say the extreme disloyalty of many of his own MP’s and party grandees as a man who has strength in abundance. I would be interested to learn how you would define a strong PM and which of the current crop of Party political leaders you feel has these qualities sufficiently to deserve your vote?